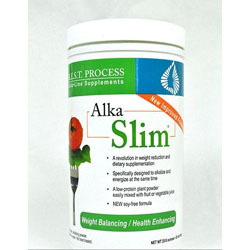 Lose weight the healthy way Whether you're looking to lose weight or an extra boost to help you get through the day Alka Slim is the easy to prepare solution to your health needs. Substitute one meal for 2 scoops of Alka Slim in your favorite fruit drink. You'll see results in no time! With your help we can reach more people and let them know about Alka Slim whether this product works or not.